Animal Kingdom's James Frecheville cuts a stone-faced figure as tersely, broodingly charismatic as a Clint Eastwood of Connemara in a slow-burning period revenge drama of stark intensity and terrible beauty. He plays Martin Feeney, a Ranger who has deserted the British Army after too many horrors in the war in Afghanistan. But it is 1847 and when he arrives back at his Irish home he finds the farmhouse destroyed, his mother dead, his brother hanged, and he's soon witness to still worse, brutally cruel tragedy. The Great Famine has taken hold and, under the social and economic policies of British rule, vast numbers of the Irish have died or fled across the seas. Abandoning his own plan to go to America, Feeney determines to seek justice of a decidedly poetic, if macabre, kind for his family; his avenger's list of targets including the constables, soldiers, bailiffs, judge, land agent and, inexorably, the Anglo-Irish estate owner (Jim Broadbent, cast well against type as the odiously arrogant, pitiless Lord Kilmichael) who doomed his people. 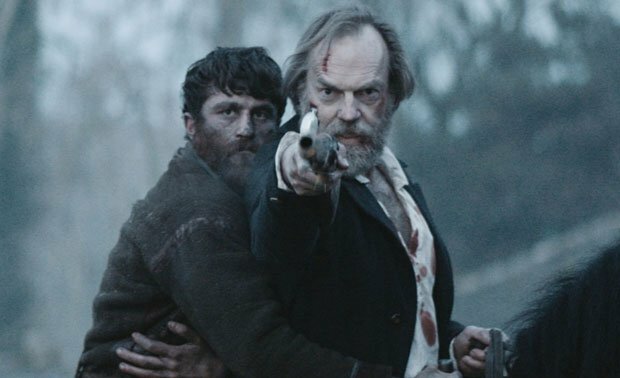 The first of his spectacular bloodlettings sets the British after him, with a hunting party comprising reluctant but relentless tracker Inspector Hannah (a superlatively bitter and weary Hugo Weaving), over-confident toff officer (Freddie Fox), his callow young orderly (the astonishingly effective Barry Keoghan) and opportunistic guide / translator / storyteller Conneely (Stephen Rea). Black 47 arrives on our shores fresh from its smash-hit success in its native Ireland. The performances are pitched perfectly, with potent dialogue in Irish Gaelic and English. It is constructed with precision by director Lance Daly, its sombre tone and harrowing tableaux emphasised by veteran American cinematographer Declan Quinn's desaturated, bleakly majestic landscapes and grim faces in the gloom, and by Brian Byrne's moody, edgy score. And if at times the accumulation of miseries, fateful twists and ragged, spectral extras becomes a bit too much, there is no denying the power of this affecting, artful history lesson and tribute to Celtic tenacity in the style of a lean, mean western. Selected release from Fri 28 Sep.
Ireland in 1847: Martin (Frecheville) is a British Army deserter who returns to the family home to find his mother dead and his brother hanged. Slow-burning period revenge drama set during the Great Famine, with pitch-perfect performances; an affecting, artful history lesson in the style of a lean, mean western.